It is no longer news that the Nigerian government through her politically positioned judge, has vowed to suppress all opinions that will uphold justice, equity, due process and Human Rights using what they referred to as "a competent court of jurisdiction". 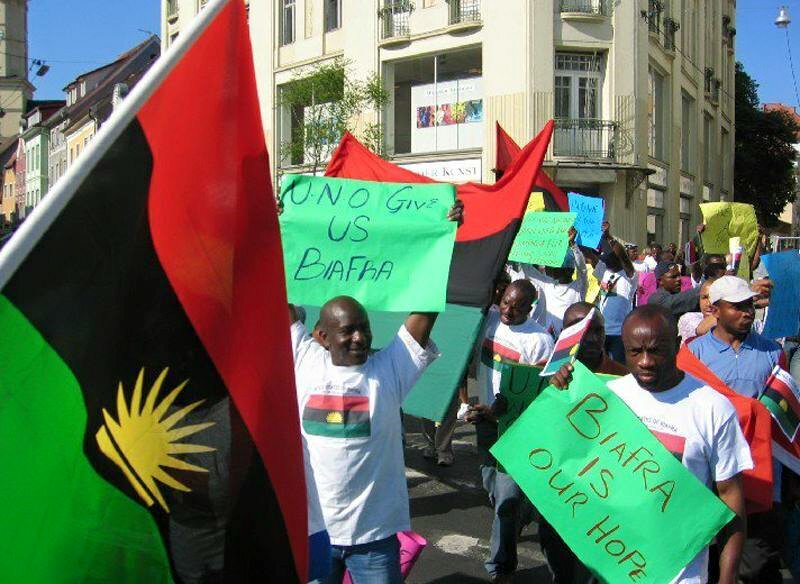 Nigeria was born out of selfishness and nepotism by a conspired intelligent colonial Master called Lord Fedrick Lugard who noticed and couldn't withstand the natural growth spurt of intelligence among the people in the Eastern Nigeria known as Biafrans, of whom if allowed to blossom will change the world positively. Any case, suggestion or opinion that x-rays the dark existence of Nigeria into beams of truth, which is light, is always referred to as terrorism, treasonable felony, heating the polity and often times earn a death sentence. It still beats my imagination with all the evidence flooding the internet, how a country called Nigeria where human lives is no where to be found in her priority list, still exist without regards to Human Rights and the freedom to choose where to live or even expression of personal views without intimidations and threats. The inhumane treatments, degradations, defaming, intimidation, intimidations, threats, etc, in Nigeria is highly encouraged by Nigerian "competent court of jurisdiction" not minding its implications before the entire world. For all it stands for, the court of law all over the world is known to be the last hope of a common man. Nigerian Courts of law have decided to dash the hope of a common man to the wind such that money, power, wealth, politicians interest, tribalism and religion have become the determinants of justice in Nigeria. It is painful to have been born in a country where human beings are seen and maltreated like animals. Nigeria as a country depends on ideas formulated by countries that respect Human Rights and uphold high level of democratic tenets, but many have wondered why Nigeria cannot implement what they have copied from these countries. It is quiet interesting to learn that some people have actually come up to suggest the reasons why Nigeria cannot respect human dignity. Among the numerous reasons that abound, two striking reasons emerged. Firstly, Nigeria as a country was founded on a faulty foundation meaning that it should not have been in existence. Secondly, the core values that grantee these norms are presently absent in Nigeria. This is why some elites believe that there is no way or grounds in which the entity called Nigeria will be in steady pace. Should we now say that these views are absolutely true as relate to Nigeria existence? Guns, judges, prisons and politics are the war tool to maintain one Nigeria and the "belief" that Nigeria is non-negotiable. Every nook and cranny in Nigeria is now painted with the blood of supposed citizens and the Nigerian courts are absolutely blind and unmovable due to political eyes interfering in judicial process. If Law courts of "competent jurisdiction" are now hijacked by selfish motives, then we will be looking at endless trials and endless postponement of court cases in Nigeria. And I ask, what then is left of a common man? The trials of Benjamin Madubugwu and Co. presently remanded in kuje prison is now a mockery before the Nigerian Law Court of competent jurisdiction. This show of Mockery is displayed when their cases are called upon, it is either the cases will not be heard/ postponed or another unfounded charges just to deny them of their Human Rights enshrined in the same constitution they always use as reference. Many of these political prisoners have been denied many things in their lives. It should be noted that Nigerian government do not have cogent verified charges against them. It is now an internal war between Christians and Muslims, no doubt the case was assigned to a core Northern Muslim who has agreed to sell her integrity just to tarnish the image or the named "court of competent jurisdiction". The world can testify the level of inhumane treatments aided by Nigerian "Court of competent jurisdiction". Who can be of help in stopping the continuous endless trials and postponement of the cases that involve the Indigenous People of Biafra(IPOB) whom their only offence is self determination. Justice Binta Nyako the current presiding Judge of the case between Benjamin Madubugwu and Co and Nigerian government has shown a high level of incompetence and thwarting of the Judicial process. She has unveiled the scarf covering the status for justice thereby presenting the Nigerian Court of Law before the world as an agent of injustice where darkness instead of light prevail.